These last couple of days have been nourishing, relaxing and full of balance, a nice change from the stress and anxiety that was rocking our lives as we prepared for the move. All of our things were loaded onto the moving truck successfully, our visit with my parents has been fabulous, I’ve had time to read, and I’m getting the opportunity to treat myself to loads of naps… always a good thing. Today’s guest recipe was meticulously created by Cara, the insanely talented photographer and recipe developer behind Cara’s Cravings. Not only has Cara taught herself everything she knows about photography, but she also contributes recipes to Clean Eating Magazine, how cool is that? You can check out her noteworthy, clean eating recipes here if you’re interested. Cara is treating us to something very special today – a moist coconut-flour chocolate cake with vegan salted caramel sauce, raw cashew cannoli cream filling, all wrapped in a velvety and rich chocolate frosting. Oh, and did I mention it’s grain-free and dairy-free? Way to go, Cara! This year for my birthday, I decided to do something really special. 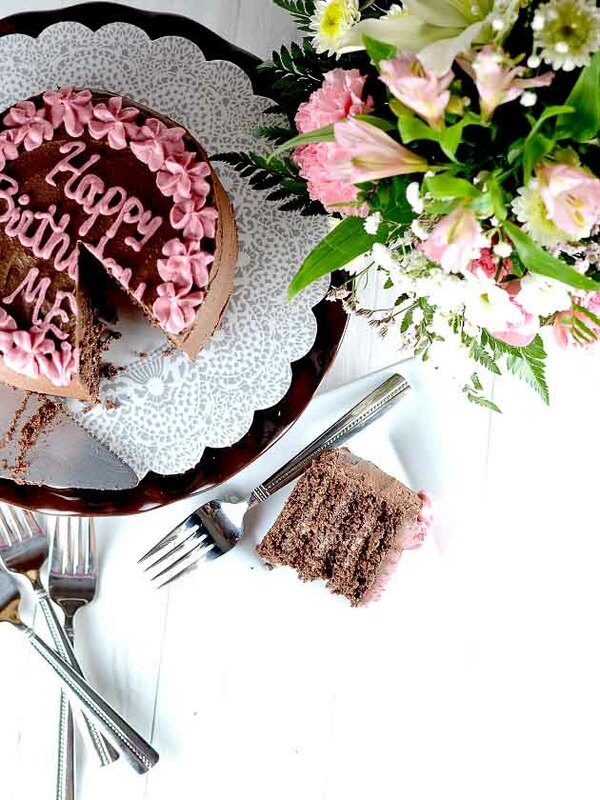 Not only am I having my cake and eating it too – but I’m also sharing it with you! As soon as Leanne invited me to write a guest post, I immediately knew I’d be challenging myself with a decadent, gluten-free and clean treat, just like the ones she makes that always have me drooling on the keyboard. You guys like dessert, don’t you? By the way, I’m Cara and I’ve been writing my blog, Cara’s Cravings, for over 5 years now. I think that makes me great-grandma in blogging years. Over the years, my cooking style has evolved from “let’s just get something semi-healthy adapted from Cooking Light on the table” to developing my own recipes that are clean (very little or no processed ingredients), wholesome and nutritious, and of course, delicious. I like my recipes to serve as a reminder that healthy food need not be boring. My faves? Chocolate, pumpkin, and goat cheese. Eggplant, salmon, kale. Eggs, chickpeas, pickles… yep, it’s a really long list. But for this indulgence I decided to focus just on the first, and perhaps my greatest love: chocolate. 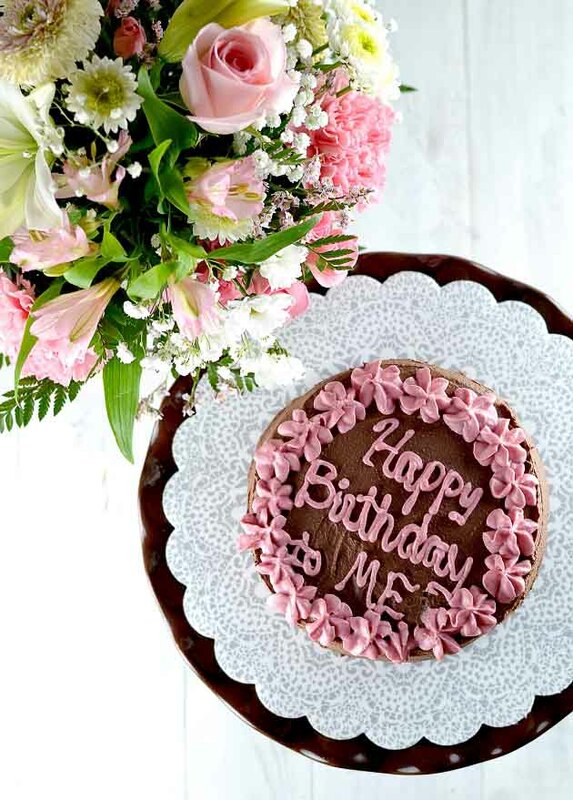 Four days before my birthday last week, I was *thisclose* to asking my hubby to order my favorite cake from our favorite local bakery: a Chocolate Caramel Cannoli Cake. 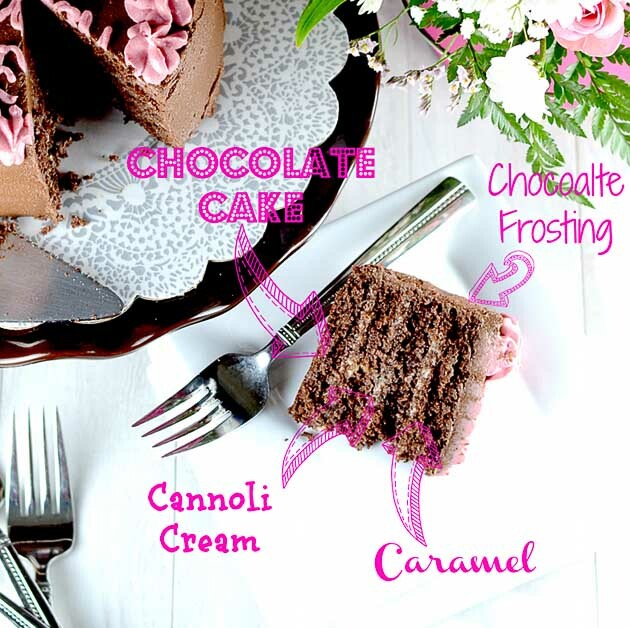 Layers of moist chocolate cake soaked in caramel, filled with tangy cannoli cream filling and covered in rich chocolate icing, this cake just screams special occasion, doesn’t it? We had it as our wedding cake, and it has made an appearance for many family birthday parties since then. FAQ: What DO you eat? Answer: Just about everything. I have a habit of confusing people, especially close friends and family, who observe that much of what I’ve been blogging the past year or so has been gluten-free and dairy-free. I do not have an intolerance to either of these, but I try to keep them out of the things I make at home, most of the time. For me it’s related to having everything in moderation, and finding alternative ingredients that are nutritious, clean, and fun to work with! …just in case you’re wondering why I was going to order this cake in the first place. At first glance, this cake might seem like a lot to tackle, but there’s good news: all the pieces can be prepared a day or two ahead of time, so you can spread out the work (which honestly, is not too much at all.) And the best part? It’s so worth it in the end. I invited over a good friend who is gluten-free and dairy-free, and she not only proclaimed this cake “award winning” but started dreaming up the e-book I will supposedly write containing mix-and-match cakes, fillings and frosting to build the perfect layer cake. When I offered to maker her one for her birthday, she said, “well why not my half birthday? and three-quarter birthday?” I mean, not to brag or anything. But it was really that good. Similarly, I don’t plan to wait until my next birthday to let this celebration cake grace my kitchen again. Next Tuesday sounds like a perfectly good day to eat cake, doesn’t it? A moist coconut-flour chocolate cake with vegan salted caramel sauce, raw cashew cannoli cream filling, all wrapped in a velvety and rich chocolate frosting. Preheat oven to 350¼F. Trim a sheet of parchment paper to fit in a half-sheet size (18"x13") rimmed baking sheet, and place in the bottom of the pan. Beat the eggs, xylitol, stevia, and almond milk in a with an electric mixer on medium speed until light. Beat in coconut oil. Measure in the remaining ingredients. Start mixing on low speed for about 30 seconds, then stop to scrape the sides of the bowl with a spatula. Start the mixer on low again and gradually increase to high, beating for about 2 minutes, until no lumps remain. Pour the batter into the prepared pan and spread to fill the edges. Bake for about 15 minutes, or until a toothpick inserted in the center comes out clean. Cool completely. Drain the cashews and add to a food processor or high-speed blender along with the almond milk. Blend for 30 seconds. Add remaining ingredients except for coconut oil. Blend for several minutes, until smooth and creamy, stopping to scrape the sides of the bowl as needed. Blend in the coconut oil. Transfer to a container, and refrigerate for several hours or overnight. Bring the coconut milk, coconut sugar, maple syrup and salt to a boil in a small saucepan, stirring to dissolve the sugar. Reduce heat to medium and simmer for about 3 minutes, stirring often. Turn off heat and stir in vanilla extract. Cool, then transfer to a small bowl or container and refrigerate until ready to use. Place the dates in a small saucepan and add enough water to cover. Bring to a boil, then cover, reduce heat to low, and simmer for 10 minutes. Drain the dates, reserving ½ cup water. Add the dates and water to the food processor or high-speed blender. Add the chickpeas and coconut milk, and blend for 3-4 minutes, until smooth, stopping to scrape the sides of the bowl as needed. Add vanilla, stevia, salt, and espresso and blend again until incorporated. Add cocoa powder and process until smooth. Lastly, blend in the coconut oil. Transfer to a medium-size bowl, cover, and refrigerate overnight. Drain the cashews and dated and add to a food processor or high speed blender, along ¼ cup date soaking water and coconut milk. Blend for 3-4 minutes, until nearly smooth, stopping to scrape the sides as needed. (At this point I found it helpful to transfer to the mixture and use my high-speed stick blender, which does a better job of pureeing smaller amounts.) Add the vanilla, salt, and stevia, and beet, blending again until smooth. Blend in arrowroot, then coconut oil. Cover and refrigerate overnight. 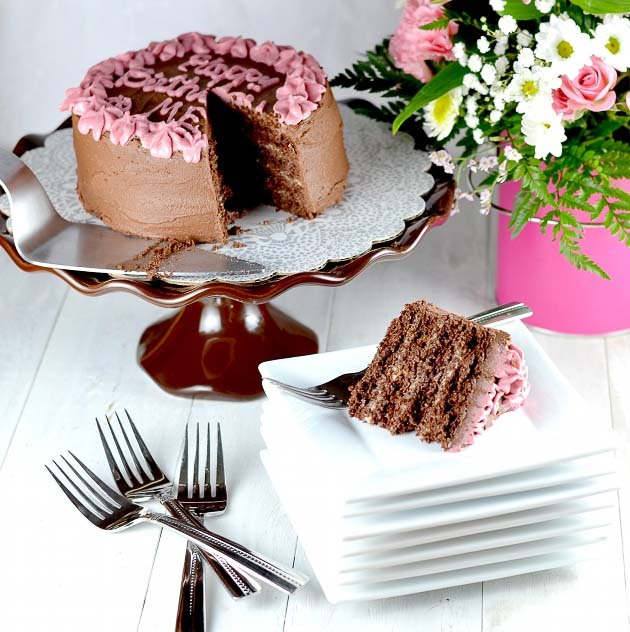 Carefully transfer one cake layer to a cake board or serving platter. 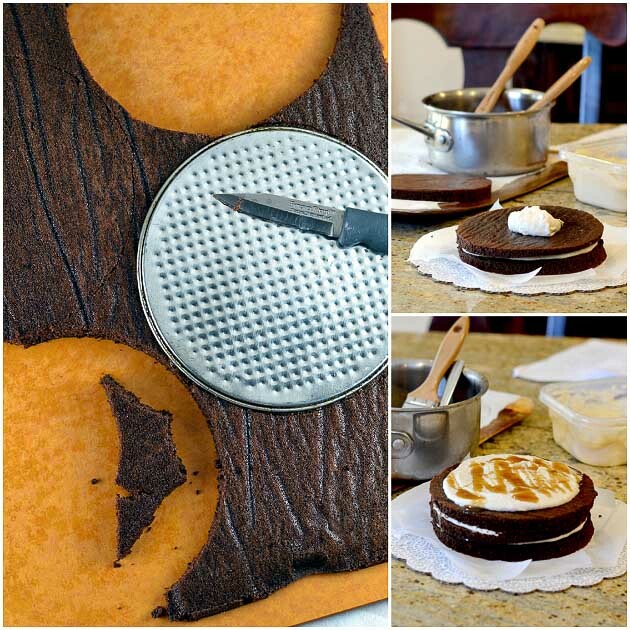 Cut several strips of waxed paper or parchment paper and place under the edges of the cake. Remove the chocolate frosting from the refrigerator. Beat for 20 seconds with an electric mixer. Use a spatula to spread a thin layer of frosting around the sides and over the top of the cake, being careful not to transfer any cake crumbs back to the frosting bowl. 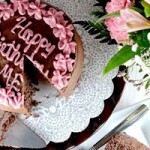 Place the cake and remaining frosting in the refrigerator for several hours, until the frosting has firmed up. Beat the frosting again to make it fluffy, and spread the final frosting layer over the top and sides of the cake. Transfer the pink frosting to a piping bag fitted with desired decorating tips, and ice as desired.